Diversified Graphic Machinery has introduced its new compact designed Folidex “Plus” Cold Foil Indexing Application System and featuring in-line Filmdex UV Cast and Cure technology at GRAPH EXPO 14. The North American debut of Foildex “Plus” Cold Foil Indexing Application System follows a Cold Innovation Summit held this summer at Diversified Graphic Machinery’s facility in Turin, Italy. 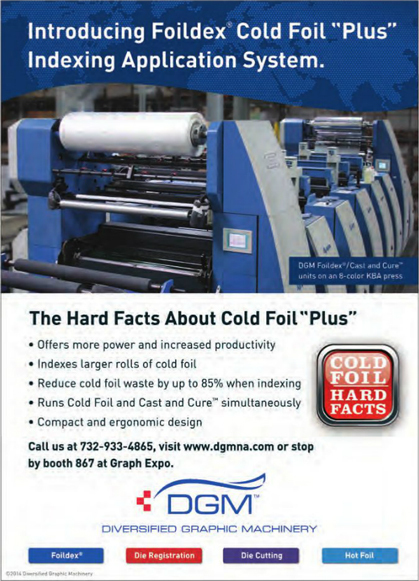 DGM’s Folidex “Plus” Cold Foil Indexing Application System boasts more power and increased productivity than its predecessor.